Portlanders are a strange demographic of Americans. It seems like every other vehicle on the I-5 is a Pius with an Obama sticker. Are you kidding? Where I come from, if you spot an Obama sticker, you have to assume it was placed ironically. The county where I live gave Obama just 27% of the vote. And, trust me, he hasn’t gotten any more popular. Imagine that percentage if an actual REAL Republican had challenged Obama. Portland also has a light rail system that Portlanders actually use. Weird. Unfortunately every semi-pro, AAA minor league mid-sized city in America is trying to thrust money-sucking public transit on its taxpayers using Portland as a shining example of success. Trust me, it won’t work anywhere but here. Remember, Portlanders are weird. Uniquely so. Portland is also one of the most “homeless friendly” cities in the country. Not surprisingly, you can’t go one block downtown without being accosted by some drugged-out beggar squatting on the side walk. Build it, and they will come. Indeed. But besides mass transportation, beggars and strong coffee, Portlanders also have a good appreciation for quality food. Fuller’s Coffee Shop downtown is a perfect example. 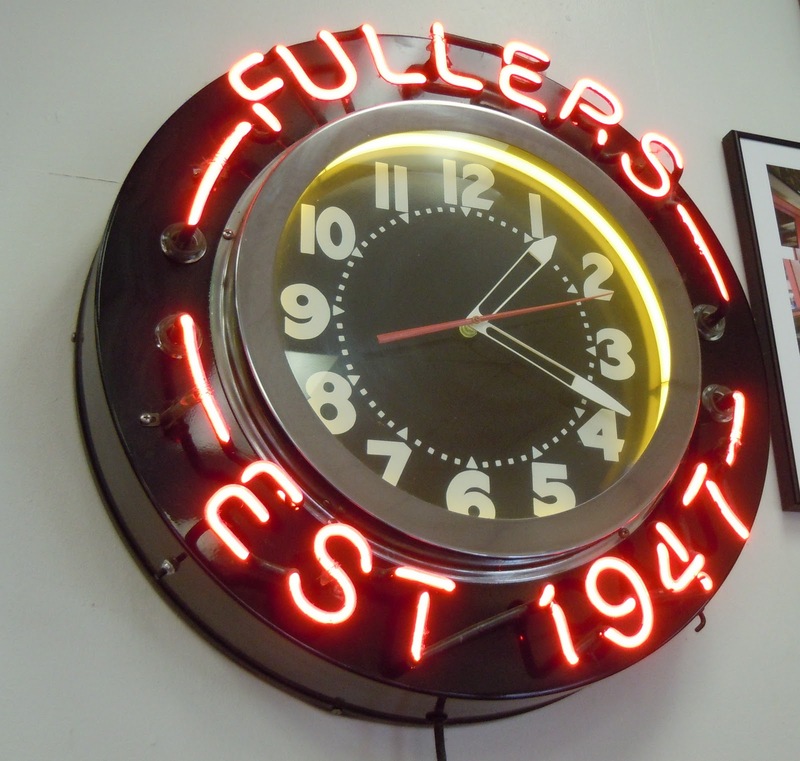 Everything at Fuller’s – from the omelets to the fried seafood to the hash browns to the toast – is top notch with an exquisite attention to simple comfortable culinary detail. None of my Suit757 trips to Portland are ever complete without at least one meal at this 65 year old institution. 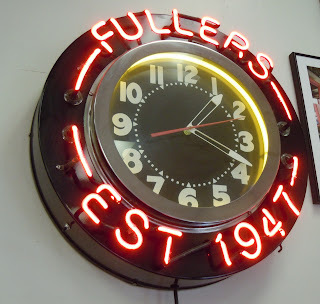 A throw-back to simpler times (before taxpayer subsidized hybrid cars and needle exchange programs), Fuller’s is a nostalgic oasis. A big mural on NW 9th Avenue depicts a scene of content customers dining at Fuller’s counter from a long ago distant era. Happily, not much has seemed to change. Folks still come here to crowd around the serpentine lunch counter or the couple of sidewalk outdoor tables for the best breakfast and coffee in town. 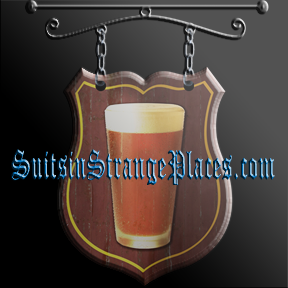 Of course, if you’ve been paying attention to this website, you know Suit757 doesn’t drink anything but beer or water. So, sorry, I have no idea whether the coffee is any good…but one can assume. Thanks to the utter incompetence of Continental Airlines, it had been nearly 24 hours since my last meal. And it was no longer breakfast hours. To make a long, sleep-deprived story short, instead of arriving in Portland at 2am Eastern Time, I ended up in Seattle at 3am, drove 150 miles and got to my hotel at 6am. After a couple hours of shut eye and two meetings, I was ready for lunch. After all, it was 2pm, according to my biological clock. By far, Fuller’s most unique lunch offering is fried razor clams. So unique in fact that I don’t recall ever seeing them on a menu anywhere else. And Suit757 has perused a lot of menus in his day! Razor clams are a local Pacific Northwest delicacy not for the squeamish. I mean, these babies aren’t those little thumb-sized dudes you get on the East Coast, where you can slurp them down after quick bite and a swallow. Nope. You’re going to get a little more intimate with your clams when you order razors. First of all, they are Jurassic-sized – up to half a foot long! You have to break out a knife and a fork to eat these babies. While by no means chewy, Fuller’s razor clams put up a bit of tooth resistance. You’re not going to just slurp these down. There’s no bypassing getting your taste buds acquainted with their clammy flavor. Fortunately, that’s a good thing. Coated in a soft, pillowy seasoned batter, Fuller’s razor clams offer up a unique taste of the sea. Fried seafood perfection. My three or four clams were served on top of a generous bed of freshly cut French fries. The good kind with the potato skin and all. The cole slaw and tarter sauce were excellent also. No attention to detail at Fuller’s is ever missed. For example, every meal at Fuller’s – even a carb loaded lunch plate like mine – is accompanied by toast. But not just any toast. Not the kind of toast Suit757 normally tosses aside in search for real food. That would be a mortal sin at Fuller’s. I have no idea what makes the toast here so good. Maybe it is the dense sweet bread Fuller’s uses. Or the fact that they paint every crevasse and all four corners with a generous brush of real melted butter. Or the fresh fruit preserves they provide on the lunch counter. Most shocking of all was the amount on the check. Single digits for all this great food! No doubt about it. Portland is an odd place. But amid all the panhandlers (both those screaming at you from the sidewalk and the more subtle Obama voters) as long as the sign outside Fuller’s says “Open”, at least I know I won’t go hungry. Or broke.